Rotary District 5495 Conference 2019 Registration is OPEN! 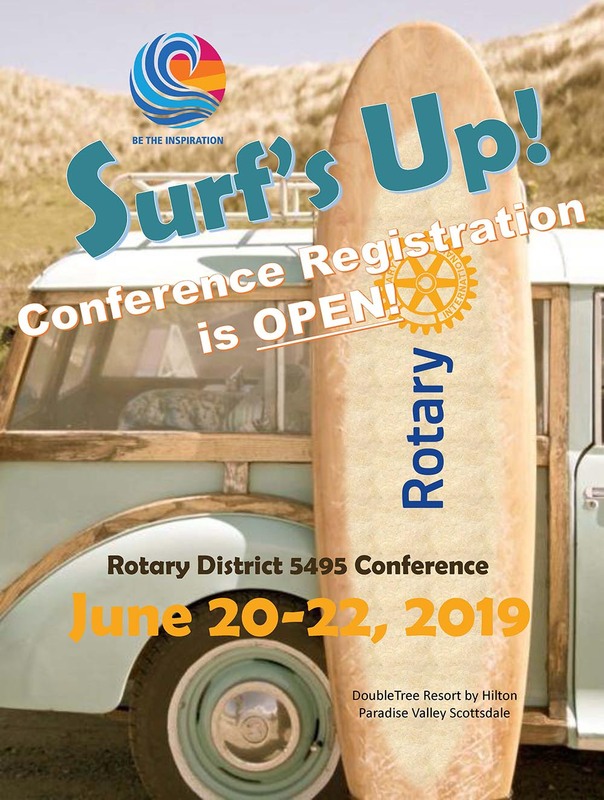 Register now for the Rotary District 5495 Conference, to be held on June 21 & 22, 2019 at the DoubleTree Resort by Hilton Paradise Valley Scottsdale. On Friday June 21, the morning will begin with the Annual Meetings of the e-Clubs, and Council On Legislation. Conference will officially open with lunch at Noon on Friday. The day will be capped off with the Surf’s Up! Party, featuring live music from the Southwest Surfers. Conference continues on Saturday with highlights such as Rotary Under 30, Keynote speaker Judge Tommy Webb, and Rotary’s Got Talent- Season 2! The fun weekend will continue with Toga Party Hospitality Night! Watch your email box for upcoming announcements about Rotary District 5495 Conference 2019. See you there!